Madrid is the capital of Spain and is located some 1,450km south-west from Amsterdam. Flying is generally the quickest and easiest option. Flights between Amsterdam Schiphol (AMS) and Madrid Barajas (MAD) airports take around 2 hours 30 minutes. Both Spain and the Netherlands belong to the Schengen Zone meaning you do not need a passport control check when travelling between Amsterdam and Madrid. Madrid airport is connected to the city centre by train and metro. See here for getting from Schiphol Airport to central Amsterdam. Dutch airline KLM (Skyteam alliance) flies 5x daily non-stop between Amsterdam and Madrid using Boeing 737s. Return prices start from around €110 – not including checked luggage. Spanish carrier and fellow Skyteam alliance member Air Europa flies up to 2x daily with Boeing 737/787 equipment on the Amsterdam-Madrid route. Return prices tend to be more expensive than KLM, starting at the €130 level but often around the €200 mark. Iberia Express, the no-frills carrier of Iberia (IAG) flies 2x daily between Amsterdam and Madrid using Airbus aircraft. Prices on the route are broadly similar or a little cheaper than KLM with returns from €60 excluding luggage. Other airlines that serve Amsterdam and Madrid indirectly are Air France (via Paris), British Airways (via London), Lufthansa (via Munich), Swiss (via Zurich) or Vueling (via Barcelona). There are no direct rail services between Amsterdam and Madrid and no plans in the future for such a service. 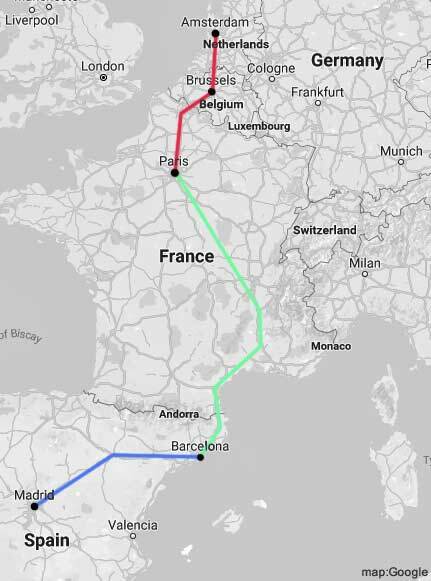 However, it is possible to travel by rail from Amsterdam to Madrid during the daytime by making connections in Paris, France and Barcelona. The Amsterdam-Madrid journey can be made in a total of just under 15 hours – although it would probably be advisable to break the journey by staying overnight en-route. 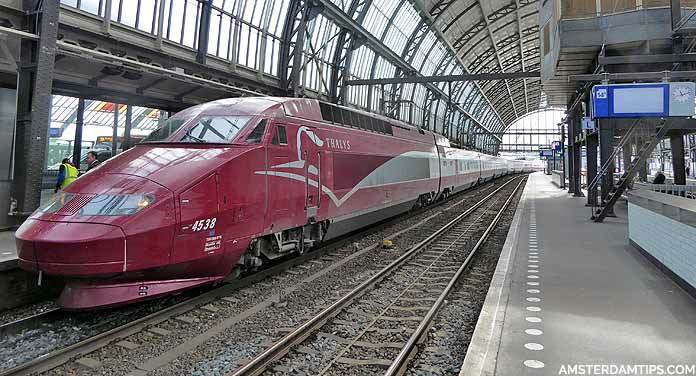 (1) A Thalys high speed train between Amsterdam Central and Paris Gare du Nord which takes 3 hours 17 minutes. It runs up to 10x daily and stops at Schiphol, Rotterdam, Antwerp and Brussels. For more info on this train see international trains from Amsterdam. (2) Paris transfer between stations Gare du Nord and Gare de Lyon. This can be made in about 30 minutes using the RER D line – it is just 2 stops. Alternatively you can take a taxi. 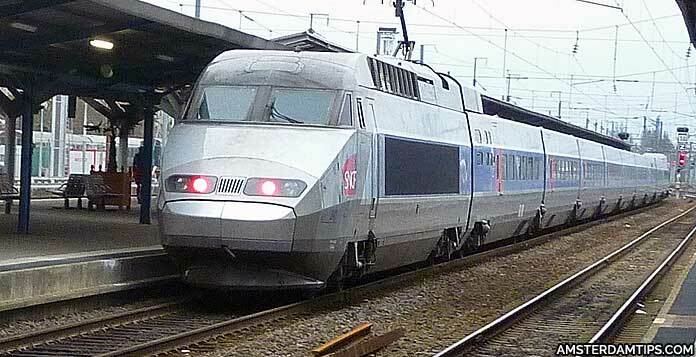 (3) A direct TGV duplex train between Paris Gare de Lyon and Barcelona Sants which takes about 6 1/2 hours. It runs 2x daily (4x daily in July/August). See our Amsterdam-Barcelona travel page. (4) A RENFE AVE high speed Spanish domestic train from Barcelona Sants to Madrid Atocha via Zaragoza. These run regularly through the day and the journey takes under 3 hours. Amsterdam-Madrid rail journey by day: Take the 0817 Thalys train departing Amsterdam which arrives at Paris Gare du Nord at 1135. From here make your way over to Gare de Lyon station by RER or taxi. A 2 1/2 hour connection in Paris allows enough time for the transfer and some lunch. To find the TGV platforms follow the signs to “Accès aux trains Grandes Lignes“. From Paris Lyon take the TGV train at 1407 going to Barcelona – this service stops at Valence, Nîmes, Montpellier, Narbonne, Perpignan, Figueres and Girona – before arriving in Barcelona Sants at 2034. From Barcelona take the high speed RENFE AVE train (departs 2115) which travels via Zaragoza and arrives at Madrid Atocha in less than 3 hours at 0002. Alternatively, make an overnight stop in Barcelona and take one of the regular AVE services to Madrid the following day. Madrid-Amsterdam rail journey by day: Take the early morning AVE from Madrid Atocha which normally departs at 0610 and arrives at Barcelona Sants at 0840. Then hop on the TGV Duplex train leaving Barcelona at 0925 that arrives in Paris Lyon at 1553. Cross over to Paris Nord to take the 1725 Thalys train which will get you into Amsterdam Central at 2042. It may be preferable to overnight in Paris or Barcelona rather than making the whole trip in a single day. For example, take the early morning TGV departure from Paris at 1007, arriving in Barcelona at 1642. Then connect to the AVE leaving Barcelona at say 1700 getting you into Madrid at 1945. Fares for the trip are made up each component (Thalys + TGV + AVE). Thalys singles between Amsterdam and Paris start at €35 (2nd class) or €79 (1st class) for the cheapest “Standard Mini” tariff. One-way fares for the Paris-Barcelona TGV train are priced from €59 (2nd class) or €79 (1st class). The Barcelona-Madrid AVE train starts at €32 (2nd class) or €69 (1st class). Eurolines runs regular coach connections from Amsterdam Duivendrecht to Madrid (Avenida America or Est Sur bus station) – note a change of bus is required in Paris. The journey takes around 29-35 hours and one-way fares are priced from €60. Flixbus also offers an Amsterdam-Madrid coach service via Paris with one-way fares from €58. Journey times are 25-26 hours and the Flixbus stops are at Amsterdam Sloterdijk and Amsterdam Bijlmer.